The disposition of veliparib [(R)-2-(2-methylpyrrolidin-2-yl)-1H-benzo[d]imidazole-4-carboxamide, ABT-888], a novel and potent inhibitor of poly(ADP-ribose) polymerase for the treatment of cancers, was investigated in rats and dogs after intravenous and oral administration of [3H]veliparib and compared with that of humans. Veliparib absorption was high. Dosed radioactivity was widely distributed in rat tissues. The majority of drug-related material was excreted in urine as unchanged drug (approximately 54, 41, and 70% of the dose in rats, dogs, and humans, respectively). A lactam M8 and an amino acid M3 were two major excretory metabolites in animals. In the circulation of animals and humans, veliparib was the major drug-related component, and M8 was one of the major metabolites. Monooxygenated metabolite M2 was significant in the rat and dog, and M3 was also significant in the dog. Veliparib biotransformation occurred on the pyrrolidine moiety via formation of a lactam, an amino acid, and an N-carbamoyl glucuronide, in addition to oxidation on benzoimidazole carboxamide and sequential glucuronidation. In vitro experiments using recombinant human cytochrome P450 (P450) enzymes identified CYP2D6 as the major enzyme metabolizing veliparib with minor contributions from CYP1A2, 2C19, and 3A4. Veliparib did not inhibit or induce the activities of major human P450s. Veliparib was a weak P-glycoprotein (P-gp) substrate, showing no P-gp inhibition. Taken together, these studies indicate a low potential for veliparib to cause clinically significant P-gp or P450-mediated drug-drug interactions (DDIs). Overall, the favorable dispositional and DDI profiles of veliparib should be beneficial to its safety and efficacy. Cancer is the second leading cause of death in the United States, contributing to 23.2% of all deaths (562,875 deaths) in 2007 (Xu et al., 2010). It is estimated that 1,529,560 new cases of cancer will be diagnosed and 569,490 Americans will die of cancer in 2010 (American Cancer Society, 2010). Increased knowledge about the disease and its causes has resulted in identification of numerous new targets for potential anticancer therapies. Inhibition of poly(ADP-ribose) polymerase (PARP) has been shown to be a promising novel mechanism through targeting DNA repair. PARPs are a family of 17 enzymes that catalyze the transfer of ADP-ribose units to acceptor proteins to form ADP-ribose polymer, which is involved in multiple cellular processes such as replication, transcription, and differentiation. PARP-1 is activated by DNA damage and is primarily responsible for initiating the repair of single-strand DNA breaks via a base excision repair (BER) pathway. When coadministered with DNA-damaging chemotherapeutic agents, PARP inhibitors could potentiate the efficacy of these agents by preventing the repair of the damaged DNA through BER (Papeo et al., 2009; Rouleau et al., 2010). Thus, PARP inhibitors could be developed as chemosensitizers of DNA-damaging agents. PARP inhibitors have also demonstrated single agent effects in selected genetic backgrounds such as tumors with defects in the breast cancer-associated genes (BRCA-1 and -2), the homologous recombination DNA repair regulators. PARP inhibition blocks the BER pathway and results in “synthetic lethality” effects toward homologous recombination-deficient tumors (Papeo et al., 2009; Rouleau et al., 2010). In addition to veliparib, several other PARP inhibitors are currently in various stages of clinical development, including iniparib, olaparib, PF-1367338, MK-4827, and CEP-9722 (Penning, 2010). These agents are being developed as chemopotentiators of DNA-damaging chemotherapeutics for treatment of solid tumors (e.g., melanoma and glioma) and as single agents in BRCA-deficient breast or ovarian cancers. Efficacy and safety data from phase I and II trials demonstrated that PARP inhibitors in combination of cytotoxic agents were well tolerated and showed antitumor activity (Penning, 2010). Veliparib [(R)-2-(2-methylpyrrolidin-2-yl)-1H-benzo[d]imidazole-4-carboxamide, ABT-888] (Fig. 1) is a novel and potent inhibitor of PARP-1 and PARP-2 enzymes (Ki of 5 and 2 nM, respectively) and has demonstrated excellent in vivo efficacy in a broad spectrum of preclinical tumor models in combination with a variety of cytotoxic agents such as temozolomide (TMZ), cisplatin, cyclophosphamide, and radiation (Donawho et al., 2007; Palma et al., 2009; Penning et al., 2009). Preclinical pharmacokinetic profiles of veliparib were characterized by high plasma clearance, high volumes of distribution, and high oral bioavailability across species (Donawho et al., 2007). A phase 0 clinical study of veliparib showed the statistically significant inhibition of PARP activity in tumor biopsy specimens and peripheral blood mononuclear cells at a single oral dose of 25 or 50 mg (Kummar et al., 2009). The preliminary human pharmacokinetic profile was characterized by rapid absorption (Tmax 0.5–1.5 h postdose) and primary urinary excretion (on average, 70% of dose in urine as unchanged parent drug at the 50-mg dose) (Kummar et al., 2009). In patients receiving veliparib, the lactam metabolite M8 was shown to be a major human plasma metabolite (Wiegand et al., 2010). Preliminary phase I study results for veliparib in combination with TMZ in patients with solid tumors indicated that the treatment was well tolerated and demonstrated antitumor activity (Molina et al., 2009). At present, veliparib is being investigated in multiple clinical trials for human cancers either in combination with cytotoxic agents or as a monotherapy (http://www.clinicaltrials.gov). Structure of [3H]veliparib. T denotes the site of tritium labeling. The objectives of the current study were as follows: 1) to characterize disposition of veliparib in rats and dogs, two animal species used for safety assessment; 2) to elucidate the structures of veliparib metabolites; 3) to characterize the interactions of veliparib with human P-glycoprotein (P-gp) and assess P-gp-mediated drug-drug interactions (DDIs); and 4) to conduct in vitro assessment of DDIs mediated by cytochrome P450 (P450) enzymes. Veliparib and its lactam metabolite (M8) were synthesized as described previously (Penning et al., 2009). [3H]Veliparib was synthesized by the Radiochemistry Group, Process Research and Development, Abbott Laboratories (Abbott Park, Illinois). The specific activity of [3H]veliparib was 3.2 Ci/mmol and radioactivity purity was greater than 99%. All chemicals were of analytical grade and were purchased from Sigma-Aldrich (St. Louis, MO). Chromatography-grade solvents were supplied by EMD Chemicals (Gibbstown, NJ) or Sigma-Aldrich. Supersomes were purchased from BD Gentest (Woburn, MA). Animal studies were conducted in accordance with the guidance established by the Abbott Institutional Animal Care and Use Committees. [3H]Veliparib and nonradiolabeled veliparib were dissolved in a mixture of ethanol and 5% dextrose in water (10:90, v/v) to make a dosing solution at a final concentration of 5 mg/ml. The dose volume was 1.0 ml/kg for rats and 0.5 ml/kg for dogs for both intravenous and oral dosing. The dosed radioactivity was approximately 160 μCi/rat and 340 μCi/dog. Pre- and postdosing radioactivity purities of the dose solutions were greater than 99%. Dosing of [3H]Veliparib to Rats. Male Sprague-Dawley rats (220–300 g), age 8 to 12 weeks, were used in the studies. For bile collection, six surgically modified animals with cannulas inserted into both bile duct and duodenum (Hilltop Laboratory Animals, Inc., Scottsdale, PA) were acclimated for approximately 4 days before dose administration. The rats were housed individually in metabolism cages and fasted overnight before dosing. Food was provided 4 h after dosing. On the day of dosing, the biliary and duodenal cannulas were disconnected, and a solution of taurocholic acid (27.8 mg/ml) was infused through the duodenal cannula. Groups of three rats each received a single 5 mg/kg intravenous dose of [3H]veliparib via the superficial penile vein or a 5 mg/kg oral dose of [3H]veliparib. Isoflurane was used as anesthesia during the procedure. Bile, urine, and feces were collected at the following collection intervals: 0 to 6, 6 to 24, 24 to 48, and 48 to 72 h for bile and 0 to 24, 24 to 48, and 48 to 72 h for urine and feces. The cages were washed at the end of the study with a small amount of 70% ethanol in water, and the cage wash was collected for determination of total radioactivity. To obtain plasma samples for metabolite identification and profiling, a group of three surgically modified rats with femoral artery cannulas from Hilltop Laboratory Animals, Inc. was given a single 5 mg/kg intravenous dose of [3H]veliparib via the superficial penile vein. Serial blood samples (0.5 ml at each time point) were taken via a Culex automated blood sampling system (BASi, West Lafayette, IN) from individual rats at 0.5, 1, 2, 4, 6, and 24 h postdose. Blood samples were centrifuged at 3000 rpm and 4°C to separate plasma (Jouan CR3 centrifuge, rotor model T40; Thermo Fisher Scientific, Waltham, MA), which were stored at −20°C until analysis. To investigate tissue distribution of [3H]veliparib, 14 rats were given a 5 mg/kg i.v. dose of [3H]veliparib via the superficial penile vein. Subgroups of two rats were euthanized at 0.5, 1, 2, 4, 6, 24, and 48 h for collection of blood and selected tissues (bone, bone marrow, brain, eye, heart, kidney, liver, lung, muscle, skin, spleen, spinal cord, testes, thymus, and white fat). Blood samples were withdrawn via cardiac puncture into heparinized tubes using Vacutainers (BD, Franklin Lakes, NJ). Plasma samples were separated from blood by centrifugation. Dosing of [3H]Veliparib to Dogs. Two male beagle dogs (10–11 kg), age 2 to 2.5 years, were obtained from Marshall Research Animals (North Rose, NY) and surgically prepared at Abbott with cannulas inserted into the bile duct and duodenum. One single dog received a 2.5 mg/kg i.v. or p.o. dose of [3H]veliparib. Bile, urine, and feces were collected at the same intervals as those in rats. The cages were washed daily, and the cage wash was collected for determination of total radioactivity. Serial blood samples (5 ml at each time point) were taken from individual dog at 0.25, 0.5, 1, 2, 3, 4, 6, 8, 24, and 48 h postdose. Blood samples were centrifuged to separate plasma, which was then stored at −20°C until analysis. In Vitro Incubations with Recombinant Human P450s (Supersomes). The in vitro metabolism of [3H]veliparib was investigated with a panel of recombinant human P450 isoforms, including CYP1A1, 1A2, 2A6, 2B6, 2C8, 2C9*1, 2C18, 2C19, 2D6*1, 3A4, 3A5, and 2E1. An incubation mixture (150 μl) contained individual protein (100 pmol/ml) and [3H]veliparib (0.5 μM) in 50 mM potassium phosphate buffer at pH 7.4. The reaction was initiated by addition of 1 mM NADPH and incubated at 37°C for 60 min. The reaction was terminated by addition of 1 volume of solution of acetonitrile-methanol (50:50, v/v). After vortexing and centrifugation, the supernatant was analyzed by high-performance liquid chromatography (HPLC) analysis with radioactivity detection. To identify metabolites, [3H]veliparib (10 μM) was incubated with CYP1A1, 2C19, 2D6*1, or 3A4 (100 pmol/ml) at 37°C for 60 min. The processed samples were analyzed by HPLC-MS/MS with radioactivity detection, as described below. Total radioactivity in plasma, bile, urine, and cage wash was determined in Insta-Gel Plus (PerkinElmer Life and Analytical Sciences, Waltham, MA) scintillation cocktail by liquid scintillation counting (LSC) on a model 3100TR QuantaSmart Liquid Scintillation Counter (Packard Instrument). Total radioactivity in feces and blood was determined by LSC after sample combustion. Blood aliquots were accurately weighed in Combusto-Cones containing Combusto-Pads and burned in a Tri-Carb model 307 sample oxidizer (Packard Instrument). After mixing the combusted residue with 10 ml of Monophase (Packard Instrument), total radioactivity was determined by LSC. Feces were sufficiently covered in 70% ethanol in water, followed by homogenization with a high-frequency homogenizer (Omni GLH-1; Omni International, Kennesaw, GA) before sample combustion. Total radioactivity in tissue homogenates was determined by LSC after sample solubilization. Tissues except for bone were homogenized in 70% ethanol in water. The exact weight of the homogenate was recorded. Duplicate aliquots of homogenate or bone were accurately weighed in scintillation vials in combination with a sufficient volume (approximately 0.5–2.0 ml) of 1 N sodium hydroxide to digest the sample. Samples were placed in an incubator (Thelco model 6DM; Precision Scientific, Winchester, VA) at approximately 40°C overnight or until dissolved. After digestion, 10 ml of Insta-Gel Plus scintillation cocktail was added, and total radioactivity was determined by LSC. Final radioactivity concentrations were determined from the specific activity of the dose solution using DEBRA data management software (version 5.7.6.100; LabLogic Systems Ltd., Sheffield, UK). Processing of animal samples for metabolite identification and profiling. Rat plasma (90 μl) was pooled from three rats at each time point. Pooled samples were extracted with 4 volumes of acetonitrile-methanol (50:50, v/v), followed by vortexing and centrifugation at 3000 rpm at 4°C for 30 min using a Eppendorf 5810R centrifuge (rotor model A4-81; Eppendorf AG, Hamburg, Germany). Supernatants were concentrated in a Savant SpeedVac (Thermo Fisher Scientific) for 4.5 h. The residue was reconstituted in 100 μl of methanol-water (50:50, v/v) before HPLC-MS/MS analysis. Dog plasma (1–2 ml) at each time point was sequentially extracted with 5 and 8 ml of acetonitrile-methanol (50:50, v/v). After vortexing and centrifugation, the supernatants were concentrated by SpeedVac overnight, and the residue was reconstituted in 180 to 240 μl of methanol-water (50:50, v/v) before HPLC-MS/MS analysis. Rat urine or bile samples were pooled at equal percent weight from each animal, followed by centrifugation. Supernatants were transferred to vials with inserts for HPLC-MS/MS analysis. Aliquots of individual dog urine and bile samples were filtered before HPLC-MS/MS analysis. HPLC-MS/MS analysis with radioactivity detection. Veliparib and its metabolites were identified and profiled in in vitro or in vivo studies after separation by HPLC and detection by an on-line or off-line radiochemical detector coupled with a mass spectrometer. The HPLC system consisted of an Agilent 1100 series binary pump and an Agilent 1100 series autosampler (Agilent Technologies, Santa Clara, CA). Metabolites were eluted at room temperature on a Luna C18, 5 μm, 100 Å, 150 × 4.6 mm i.d. HPLC column (Phenomenex, Torrance, CA). The mobile phases consisted of 10 mM ammonium acetate in water at pH 4.0 (adjusted with acetic acid) (solvent A) and acetonitrile (solvent B). A gradient was applied, consisting of 0% B held for 10 min, followed by a linear gradient to 15% B over the next 30 min before a linear increase to 100% B in 5 min. The gradient was held constant at 100% B for 5 min before returning to the initial condition of 0% B in 1 min. The column was equilibrated at 0% B for 9 min before the next injection. The flow rate was maintained at 1.0 ml/min. For on-line radioactivity detection (rat urine and bile and dog urine), a flow scintillation detector equipped with a 500-μl liquid cell was used (β-RAM model 5; IN/US, Tampa, FL) with the scintillant (Flo-Scint III; PerkinElmer Life and Analytical Sciences) flow of 2.4 ml/min. Data were processed using Laura Light software (version 4.0.5.130; LabLogic, Broomhill, Sheffield, UK). For off-line radioactivity detection (rat plasma and dog bile and plasma), the HPLC effluent was collected into a 96-deep well LumaPlate (PerkinElmer Life and Analytical Sciences) using a fraction collector (model FC 204; Gilson, Inc., Middleton, WI) with a collection time of 3.0 s/well. The collected fractions were dried by SpeedVac and then counted on a TopCount microplate scintillation counter (PerkinElmer Life and Analytical Sciences). Radioactivity profiles were reconstituted by ProFSA software (version 3.4.3.366; PerkinElmer Life and Analytical Sciences). Two MS instruments were used for metabolite characterization. 1) An LTQ-XL ion trap mass spectrometer (Thermo Fisher Scientific), equipped with an electrospray source operated in the positive ionization mode, was used for metabolite identification of rat urine and bile, all dog samples, and in vitro samples. Key MS operating/acquisition parameters were as follows: source voltage, 5 kV; capillary temperature, 275°C; capillary voltage, 25 V; and tube lens offset, 135 V. 2) An LTQ-Orbitrap mass spectrometer (Thermo Fisher Scientific), equipped with an electrospray source operated in the positive ionization mode, was used for analysis of rat plasma, and to obtain high resolution mass for all metabolites with a resolution of 30,000. All measured metabolite masses were within ±1 millimass unit of calculated masses for the proposed metabolite structures. Key MS operating/acquisition parameters were as follows: source voltage, 4 kV; capillary temperature, 350°C; capillary voltage, 47 V; and tube lens offset, 35 V. The HPLC effluent was split with a ratio of 2:8 between the mass spectrometer and an on-line radioactivity detector or a fraction collector for off-line radioactivity detection. Isolation of M3 from dog urine for NMR analysis. From the 0 to 24 h urine collected from one dog, M3 was isolated using the aforementioned HPLC system. The purified M3 was desalted on an Oasis HLB solid-phase extraction cartridge (Waters, Milford, MA) and then dissolved in D2O for NMR analysis. 1D and 2D NMR experiments were conducted on a Varian Inova 500 MHz NMR spectrometer (Agilent Technologies) equipped with a SMIDG500 1.7-mm indirect detection gradient probe at the Abbott Structure Chemistry Group (Abbott Park, IL). Interactions of Veliparib with Human P-gp. Transport of veliparib in multidrug resistance protein 1-Madin-Darby canine kidney cells. The efflux ratio is defined as the ratio of apparent permeability between basolateral-to-apical and apical-to-basolateral directions. The net flux ratio is calculated as the ratio of the efflux ratio in MDR1-MDCK cells to the efflux ratio in wild-type MDCK cells. The integrity of cell monolayers was evaluated by measuring the amount of Lucifer yellow in the receiver chambers at the end of the whole incubation period. Inhibition of P-gp by veliparib. The inhibition potential of veliparib (0–1000 μM) on the activity of human P-gp was evaluated in duplicate in the monolayer of Caco-2 cells (DKFZ, Heidelberg, Germany) using digoxin as the probe substrate. Caco-2 cells were grown on Transwell HTS polycarbonate filters (0.4-μm pore, 24-well format; Corning, Inc., Corning, NY) for 22 days before the experiment. For transport studies, cells were rinsed, preincubated in HBSS for 30 min, and further incubated for 60 min with HBSS containing the designated concentration of veliparib on both sides. Cell monolayers were then dosed with designated concentrations of veliparib and 10 μM digoxin in HBSS containing 0.5 mg/ml Lucifer yellow to either the apical or basolateral side of the filters. Aliquots were collected at 0 and 120 min from the donor side and at 30 and 120 min from the receiver side. Digoxin was extracted from the aliquots with cold ethanol containing ketoprofen as internal standard for positive ion mode and chlorzoxazone for negative ion mode. Extracted digoxin was quantitated by liquid chromatography-MS/MS with an Agilent 1100 series HPLC system (Agilent Technologies) coupled with a AB Sciex 5000 mass spectrometry (Applied Biosystems/MDS Sciex, Foster City, CA). All procedures were done in a tissue culture incubator (Cytomat 2C450S; Thermo Fisher Scientific) maintained at 37°C with 5% CO2. The Ap-to-Bl and Bl-to-Ap permeabilities (Papp) of digoxin and efflux ratios were calculated using the aforementioned methods. The in vitro metabolism of [3H]veliparib was studied in various hepatic systems across species, including liver S9 fractions and liver microsomes and hepatocytes from mouse, rat, monkey, dog, and human. [3H]Veliparib was stable (<5% metabolism) in all in vitro hepatic systems tested (data not shown). Using a panel of recombinant human P450 enzymes, metabolism of [3H]veliparib was observed in incubations with CYP3A4, 2C19, 1A2, and 2D6*1 with turnover of 2.0, 3.4, 8.3, and 20.6%, respectively. Monooxygenation metabolite M2 was identified as the major metabolite, and the lactam M8 was also detected in these incubations. 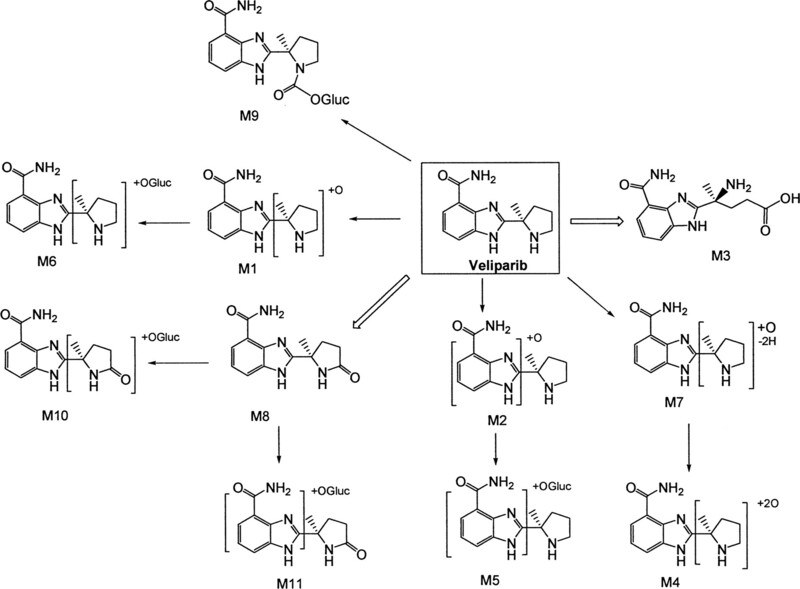 Structure Characterization of Veliparib Metabolites. Structures of veliparib and its metabolites were elucidated by liquid chromatography-MS/MS using a combination of full-scan and product ion scan (MS2 or MS3) analyses of biological samples. The structure of M8 was supported by comparisons of its HPLC retention time and mass spectrum with those of a synthetic standard. The structure of M3 was characterized by 1D and 2D NMR analysis. Structures of all other metabolites are proposed on the basis of high-resolution mass and MS2 fragmentation analysis. Parent drug veliparib eluted at ∼28 min on HPLC analysis, displaying a protonated molecular ion at m/z 245. MS/MS fragment ions at m/z 162 and 84 indicated the cleavage between benzoimidazole carboxamide and 2-methylpyrrolidine. The fragment ion at m/z 145 resulted from loss of NH3 from the ion of m/z 162. Two metabolites (M1 and M2) with same protonated molecular ion of m/z 261 were observed in urine and plasma from rat and dog eluting at approximately 26 and 27 min, respectively, by HPLC analysis. High-resolution MS analysis suggested addition of one oxygen atom (+16 amu) to veliparib. MS/MS analysis of M1 showed fragment ions at m/z 162 and 100, suggesting oxygenation on 2-methylpyrrolidine. MS/MS analysis of M2 produced fragment ions at m/z 178 and 84, suggesting that oxygenation occurred at the benzoimidazole carboxamide. M3 and M4 had the same protonated molecular ion at m/z 277, eluting at approximately 22 and 30 min by HPLC analysis of bile, plasma, and urine from rat and dog, respectively. High-resolution MS analysis suggested additions of two oxygen atoms (+32 amu) to veliparib. MS/MS analysis of M3 showed fragment ions at m/z 259 and 162, suggesting that modification occurred at the 2-methylpyrrolidine moiety. MS3 analysis of ion m/z 259 gave fragment ions of m/z 242, 225, 162, and 145. The ion at m/z 225 resulted from loss of two NH3 (−34 amu) from the ion at m/z 259, suggesting that M3 was an amino acid metabolite. 1D and 2D NMR analysis of M3 samples isolated from dog urine confirmed the proposed structure of amino acid. 1H NMR (500 MHz, D2O) δ 7.80 (d, J = 7.6 Hz, 1H), 7.75 (d, J = 8.0 Hz, 1H), 7.36 (t, J = 7.9 Hz, 1H), 2.31–2.24 (m, 2H), 2.05 (td, J = 7.3, 2.5 Hz, 2H), 1.73 (s, 3H). MS/MS analysis of M4 showed fragment ions at m/z 260, 259, 249, 232, 202, and 162. The presence of a fragment ion at m/z 162 suggested that modification occurred at the 2-methylpyrrolidine moiety. M5 was observed at approximately 19 min by HPLC analysis of bile from rat and dog and dog plasma, and M6 was observed at approximately 23 min only in rat bile. Both M5 and M6 had a protonated molecular ion of m/z 437. High-resolution MS indicated additions of one oxygen atom (+16 amu) and a glucuronic acid (+176 amu) to afford a net gain of 192 amu compared with veliparib. MS/MS fragmentation of M5 and M6 generated a common fragment ion of m/z 261, suggesting that M5 and M6 were formed through oxidation and glucuronidation of parent drug. MS/MS analysis of M5 produced a fragment ion of m/z 354, which resulted from cleavage of 2-methylpyrrolidine, indicating that modification occurred at the benzoimidazole carboxamide. 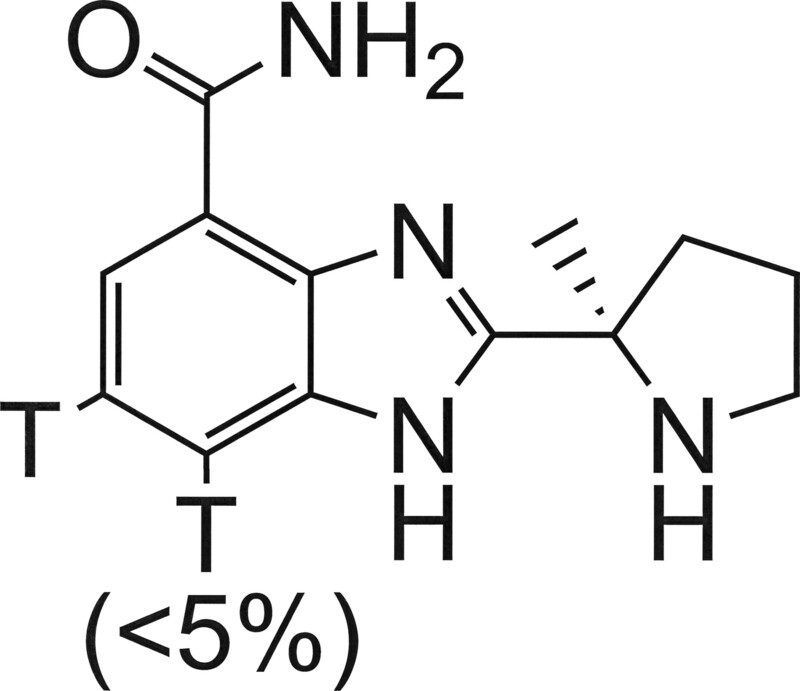 An additional ion of m/z 178 confirmed the modification site at the benzoimidazole carboxamide. MS/MS analysis of M6 generated fragment ions of m/z 276 and 162, indicating that modification occurred at the 2-methylpyrrolidine moiety. M7 and M8 eluted at approximately 33 and 37 min by HPLC analysis, respectively, displaying a protonated molecular ion at m/z 259. High-resolution MS indicated addition of one oxygen atom (+16 amu) and loss of two hydrogens (−2 amu) compared with veliparib. MS/MS fragmentation of M7 resulted in fragment ions at m/z 242, 224, 214, 197, 162, and 145. The ions of m/z 162 and 145 suggested modification at 2-methylpyrrolidine. MS/MS fragmentation of M8 generated fragment ions at m/z 242, 162, and 98, indicating that M8 was formed from modification at 2-methylpyrrolidine. The lactam structure of M8 was confirmed by comparisons of the HPLC retention time and MS spectrum with those of a synthetic standard. M9 eluted at approximately 38 min by HPLC analysis of bile and plasma from rat and dog, showing a protonated molecular ion at m/z 465, 220 amu greater than the molecular ion of veliparib. MS/MS analysis of M9 generated fragment ions at m/z 289, 245, 162, and 145, suggesting that M9 was a carbamoyl glucuronide with modification occurring at 2-methylpyrrolidine. Both M10 and M11 had a protonated molecular ion at m/z 451. M10 was only observed in rat bile with a HPLC retention time of approximately 27 min, and M11 was eluted at approximately 26 min during HPLC analysis of bile from both rat and dog. High-resolution MS analysis suggested additions of two oxygen atoms (+32 amu) and a glucuronic acid (+176 amu) as well as loss of two hydrogens (−2 amu) to afford a net gain of 206 amu compared with veliparib. MS/MS analysis of M10 showed fragment ions at m/z 275, 258, 162, and 145. The ions at m/z 162 and 145 indicated that modification occurred at the 2-methylpyrrolidine. The fragment ion of m/z 275 resulted from facile loss of a glucuronic acid (176 amu) and was 16 amu greater than molecular ion of M8, suggesting that M10 may be formed from M8 through sequential oxidation and glucuronidation at 2-methylpyrrolidine. MS/MS analysis of M11 showed fragment ions at m/z 434, 275, 258, 178, and 161. The ion at m/z 178 indicated that modification occurred at benzoimidazole carboxamide. The same fragment ion of m/z 275 suggested that M11 may be formed from M8 through sequential oxidation and glucuronidation at the benzoimidazole carboxamide. Mass spectrometric characterization of veliparib and its metabolites is shown in Table 1. The proposed biotransformation pathway of veliparib in rats and dogs is shown in Fig. 2. Proposed biotransformation pathway of veliparib in rats and dogs. Absorption and Excretion of [3H]Veliparib in Rats and Dogs. Mean total recovery of radioactivity after 72 h was 95.7% in rats and 91.3% in dog for intravenous administration and 97.6% in rats and 84.3% in dog for oral administration (Table 2). In both species, the dose of radioactivity was well absorbed and rapidly excreted in urine, with minimal radioactivity excreted in bile and feces. In rats given a 5 mg/kg intravenous dose of [3H]veliparib, mean total radioactivity recovery in 72 h was 79.4% of dose in urine and <5% in bile or feces (Table 2). For oral administration, total dose recovery in 72 h was 82.7% in urine, with 5.1% of the dose recovered in bile and 4.1% in feces (Table 2). A nearly identical excretion profile was also observed in dogs after an intravenous or oral dose of 2.5 mg/kg (Table 2). Urinary elimination of radioactivity was rapid with greater than 70% of the dose excreted within 24 h in both rats and dogs. The sum of radioactivity doses recovered in urine and bile from orally treated animals indicates that at least 87.8% of the dose was absorbed in rats and 75.9% of the dose was absorbed in dog. Rat data are presented as the mean ± S.D. Metabolism of [3H]Veliparib in Rats. Veliparib was primarily excreted in rat urine as parent drug. Radioactivity profiles in the 0 to 24 h urine collected from the intravenously dosed group showed that approximately 53.3% of the dose was recovered as parent drug. In the 0 to 6 h bile, total radioactivity recovery was only 4.1% of the dose, of which parent drug accounted for 0.6% (Table 3). A total of 10 metabolites (M1–M5, and M7–M11) were characterized in rat urine and bile. The most significant metabolite was the lactam M8, representing approximately 21.5% of the dose (19.6% in urine and 1.9% in bile). Other metabolites were minor, each representing <3% of the dose (Table 3). Similar metabolism and elimination patterns were observed after a single 5 mg/kg oral dose of [3H]veliparib to rats. Parent drug accounted for approximately 55.4% of the dose in the 0 to 24 h urine and 0.6% of the dose in the 0 to 6 h bile. The major metabolite, M8, represented 23.7% of the dose (21.5% in urine and 2.2% in bile). Other minor metabolites accounted for <3% of the dose (Table 3). Data are expressed as percentage of dose. Bold type indicates major excretory metabolites. After a 5 mg/kg intravenous dose of [3H]veliparib to rats, parent drug was the most significant radiolabeled component in the circulation, representing 30.7 to 58.0% of the total plasma radioactivity at 0.5, 1, 2, or 4 h postdose (Fig. 3). M2 and M8 were two major metabolites in circulation, representing 13.8 to 28.8% and 12.0 to 23.6% of the total plasma radioactivity, respectively. M3, M4, M7, and M9 were identified as minor metabolites, with each representing <10% of total plasma radioactivity (Fig. 3). Representative plasma HPLC-radiochromatograms from rats (0.5 h) receiving a 5 mg/kg intravenous dose and a dog (6 h) receiving a 2.5 mg/kg oral dose of [3H]veliparib. Metabolism of [3H]Veliparib in Dogs. Similar to that in rats, the urine metabolite profile from the intravenously dosed dog showed that approximately 44.0% of the dose was excreted as unchanged parent drug within 24 h. Veliparib was not observed in dog bile. A total of 10 metabolites (M1–M9 and M11) were identified. M3 and M8 were two significant metabolites in excreta, representing a total of 11.8 and 15.8% of the dose, respectively (Table 3). The majority of M3 and M8 was excreted in urine, representing 11.3 and 15.0% of the dose, respectively. Other metabolites were minor, each accounting for less than 3% of the dose. In circulation, the parent drug was the major radiolabeled component at each sampling time point. The area under the curve (AUC) of the concentration-time profile within 0 and 8 h was estimated by using WinNonlin software (version 4.0; Pharsight, Mountain View, CA). M2, M3, and M8 were identified as three major metabolites, with AUC0–8 values that were estimated to be 19.3, 21.3, and 28.8% of the veliparib AUC0–8, respectively. Minor metabolites M4, M5, M7, and M9 were present, with each having an estimated AUC0–8 <10% of the veliparib AUC0–8. Similar excretion and metabolism profiles were observed in the orally treated dog. Within 24 h, approximately 41.1% of the dose was recovered as parent drug in urine, with M3 and M8 accounting for an additional 11.2 and 17.9% of the dose, respectively (Table 3). In the 0 to 6 h bile, total radioactivity recovery was only 0.9%, and no parent drug was observed. Parent drug was the major radiolabeled component in dog plasma at each time point (Fig. 4). M2, M3, and M8 were three major metabolites, with estimated AUC0–8 values representing 27.3, 38.5, and 47.8% of parent AUC0–8, respectively (Fig. 4). Other minor metabolites were M4, M5, M7, and M9 (each <10% of parent AUC0–8) (Fig. 3). 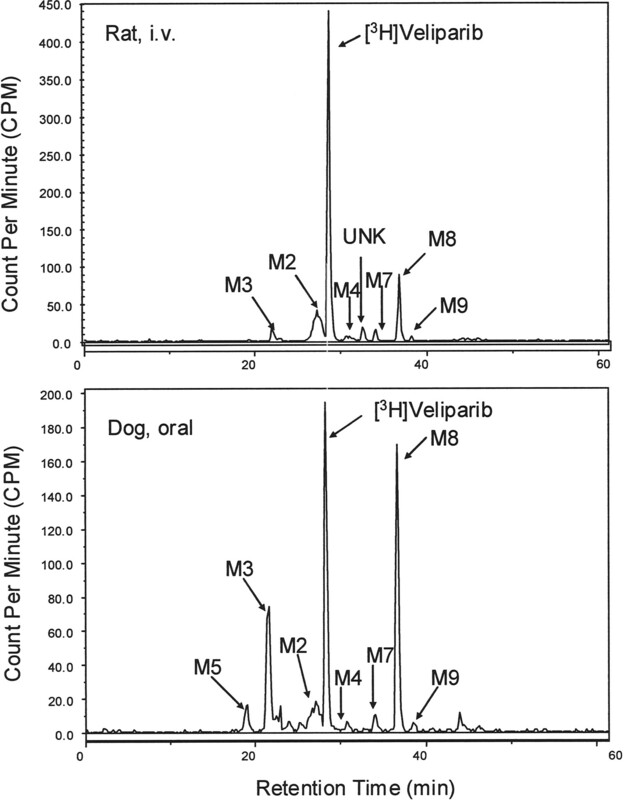 Plasma concentration-time profiles of total radioactivity, unchanged veliparib, and major metabolites M2, M3, and M8 after a single oral administration of 2.5 mg/kg [3H]veliparib to a dog. Tissue Distribution of Radioactivity in Rats. 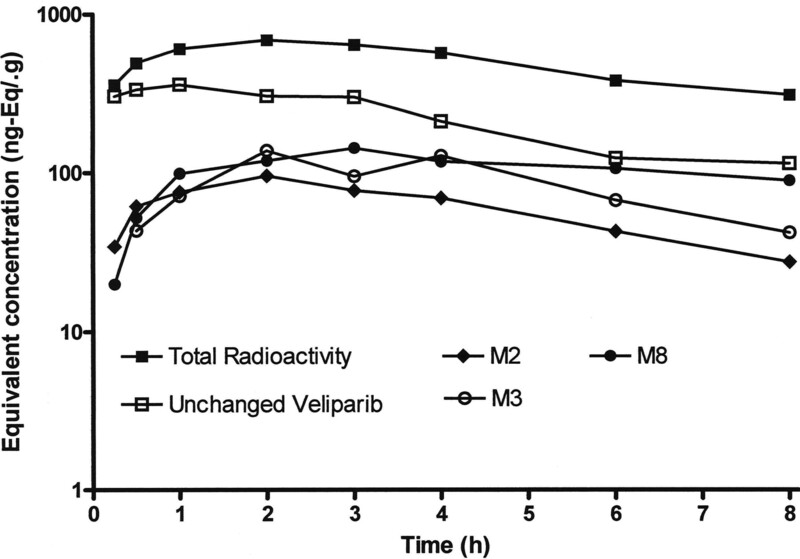 After a 5 mg/kg intravenous dose of [3H]veliparib to rats, the distribution of [3H]veliparib was extensive with radioactivity quantifiable in all tissues examined. High tissue/plasma (T/P) ratios were observed in most of the tissues (T/P ratio at 30-min postdose): kidney (5.3), liver (5.0), bone marrow (4.6), lungs (2.9), spleen (3.1), thymus (2.7), muscle (2.2), bone (1.6), skin (1.6), and heart (1.5), whereas lower T/P ratios were observed in testes (0.6), brain (0.3), white fat (0.3), and spinal cord (0.2) (Supplemental Table 1). The highest maximal concentrations (nanogram equivalents of [3H]veliparib per gram) were found in the kidneys (9537; 30 min), followed by liver (8966; 30 min) and bone marrow (8222; 30 min) (Supplemental Table 1; Fig. 1). Maximal radioactivity concentrations were observed 30 min postdose in all tissues, and the concentrations declined with time. After 48 h postdose, less than 80 ng-Eq of [3H]veliparib/g radioactivity remained in any of the selected tissues. T/P ratios generally decreased or remained unchanged for most tissues. Permeability and transport of veliparib were evaluated in triplicate in both MDR1-MDCK and wild-type MDCK cell monolayers at 1 μM to investigate whether veliparib is a substrate for human P-gp (MDR1). Veliparib had high apparent apical-to-basolateral permeability values of 8.2 ± 1.0 × 10−6 cm/s in wild-type MDCK cells and 13.4 ± 2.1 × 10−6 cm/s in MDR1-MDCK cells. The efflux ratio was 1.0 in wild-type MDCK cells and 1.8 in MDR1-MDCK cells. The net flux ratio of veliparib in MDR1-MDCK cells was calculated to be 1.8, suggesting that veliparib was a weak substrate for human P-gp. Quinidine, ranitidine, and talinolol are known P-gp substrates and were used as positive controls in the assay, showing net flux ratios of 3.9, 2.9, and 10.7 in MDR1-MDCK cells, respectively. Recoveries of test articles were high (≥88%). The inhibition potential of veliparib on human P-gp activity was evaluated in a Caco-2 monolayer using digoxin as the probe P-gp substrate at veliparib concentrations of 0 to 100 μM in the first study and at 1000 μM in a second study. The efflux ratio of 9.2 for digoxin transport in Caco-2 cells was observed in the first study, and this efflux in digoxin transport was completely inhibited in the presence of the P-gp inhibitor verapamil at 30 μM (digoxin efflux ratio of 1.6). In contrast, veliparib did not demonstrate significant inhibition of the P-gp-dependent efflux of digoxin up to the highest tested concentration of 100 μM (digoxin efflux ratios: 7.5–14.7). In a second study, P-gp inhibition by veliparib was investigated in Caco-2 cells at the veliparib concentration of 1000 μM. An efflux ratio of 4.2 was observed for digoxin transport, which was inhibited by 30 μM verapamil (digoxin efflux ratio of 1.4), but was not affected by 1000 μM veliparib (digoxin efflux ratio of 4.9). Veliparib, a novel PARP inhibitor being developed for treatment of cancer, demonstrated high and rapid absorption. In bile duct-cannulated rats and dogs, at least 87.8 and 75.9% of dosed radioactivity was absorbed, respectively, consistent with high oral bioavailability (>60%) (Donawho et al., 2007). Likewise, high absorption of veliparib was indicated in humans by, on average, 70% of the dose being recovered as parent drug in urine (Kummar et al., 2009). Veliparib absorption was also rapid with Tmax ranging from 0.5 to 2.3 h in animals and 0.5 to 1.5 h in humans after oral administration (Donawho et al., 2007; Kummar et al., 2009). Renal secretion is the primary route of veliparib clearance. In bile duct-cannulated rats and dogs, drug-related materials were primarily eliminated in urine, with a significant portion as parent drug (>40% of dose). In humans, approximately 70% of the dose was consistently excreted in urine as parent drug. An in vitro study demonstrated that veliparib is a substrate for human organic cation transporter 2 (OCT2), a renal transporter involved in active secretion of cationic drugs (R. Kikuchi, Y. Lao, D. Bow, R. Voorman, and S. de Morais, manuscript in preparation). Both in vivo excretion profiles and in vitro transporter data suggest the involvement of active renal secretion and support the conclusion that renal clearance is the primary mechanism of veliparib clearance. The excretion profile of veliparib is similar to that of varenicline, which is also primarily excreted as the parent drug in urine of animals and humans and is an OCT2 substrate (Obach et al., 2006; Feng et al., 2008). In a clinical DDI study with cimetidine, an OCT2 inhibitor, a small increase in varenicline exposure was observed (Feng et al., 2008). A moderate increase in varenicline exposure was also observed in patients with renal impairment (Obach et al., 2006). Given the similarity of clearance mechanisms between veliparib and varenicline, veliparib exposure could be altered with concomitantly administered cimetidine or in patients with renal impairment. The clinical significance of these potential interactions may need further evaluation. Metabolism plays a secondary role in veliparib clearance. In excreta of animals, metabolites contributed up to 33% the dose. A total of 11 metabolites were characterized. The lactam M8 was the most significant metabolite in both species, accounting for 15 to 24% of the dose. The amino acid metabolite M3 represented an additional approximately 11% of the dose in dogs. In circulation, M8 and monooxygenated metabolite M2 were two major metabolites in rats and dogs. M3 was another major circulatory metabolite in dogs. Consistent with animal plasma profiles, M8 was a major plasma metabolite in patients receiving veliparib (Wiegand et al., 2010). M8 was approximately 5-fold less potent than veliparib for in vitro PARP inhibition (Ki 23 nM) (Penning et al., 2009). A radiolabeled mass balance study has not been conducted in humans, and radioactivity profiles of human plasma and urine are unknown. Metabolite profiling studies with nonradiolabeled human plasma samples suggested that the preliminary metabolite profile was similar to those in rats and dogs. Parent drug was the major component, and three metabolites were characterized including M8 as a major metabolite and two minor metabolites, M2 and M9 (N-carbamoyl glucuronide) (X. Li and Y. Lao, unpublished data). Veliparib metabolism mainly occurred on the pyrrolidine to generate lactam, amino acid, N-carbamoyl glucuronide, and products of monooxygenation and oxidation followed by dehydrogenation. Additional monooxygenation occurred on the benzoimidazole carboxamide. Other secondary glucuronide metabolites were formed from the above primary metabolites. Pyrrolidine is well known to be metabolized to form lactam via either iminium ions or carbinolamines (Vickers and Polsky, 2000). The amino acid metabolite is not believed to be formed from lactam hydrolysis; rather it is proposed to arise from the amino aldehydes that may be produced from ring opening of unstable carbinolamine intermediates (Vickers and Polsky, 2000). Multiple recombinant human P450s including CYP2D6, 1A2, 2C19, and 3A4 demonstrated the ability to metabolize veliparib to generate M2 and M8. Veliparib demonstrated wide tissue distribution and crossed the blood-brain barrier (BBB) in rats. After a single intravenous dose of [3H]veliparib to rat, the dosed radioactivity was distributed widely to all selected tissues, consistent with the high volume of distribution (3.1 l/kg) observed in the rat pharmacokinetics profile. The highest radioactivity concentrations were observed in kidneys, consistent with the predominant urinary excretion of drug-related radioactivity. Drug-related radioactivity was observed in brain, with the brain/ plasma (B/P) radioactivity concentration ratio ranging from 0.3 to 1, indicating moderate brain penetration. The data are consistent with previous results for central nervous system penetration in mouse, rat, and monkey, in which veliparib demonstrated a B/P ratio of approximately 1:3 in rats and mice and cerebrospinal fluid penetration of approximately 57% in monkey (Donawho et al., 2007; Penning et al., 2009; Muscal et al., 2010). Because human P-gp in the BBB is primarily responsible for limiting the entry of drugs into the brain, it is important to determine whether veliparib is a substrate for human P-gp. A previous study reported a good B/P ratio of 0.98 in wild-type mice treated with a single intravenous dose of 10 mg/kg veliparib. The B/P ratio increased in mdr1a/1b double knockout (KO) (4.5), bcrp KO (1.5), or triple KO mice (7.5), indicating that brain penetration of veliparib was affected by P-gp and breast cancer resistance protein (Fan et al., 2010). Consistently in our study, veliparib was shown to be a weak substrate for P-gp with a low net flux ratio of 1.8 in MDR1-MDCK cells. A net flux ratio of more than 2 is considered a positive result for a P-gp substrate (U.S. Food and Drug Administration, 2006). Although veliparib is a weak substrate for P-gp and its brain penetration was affected by P-gp, because of its high permeability, veliparib could still penetrate through the BBB via passive diffusion to achieve sufficient exposure. This result is consistent with the finding that veliparib in combination with TMZ demonstrated efficacy in a preclinical brain tumor model (Donawho et al., 2007). Veliparib is being investigated in clinical trials in patients with brain and central nervous system tumors (http://www.clinicaltrials.gov). P-gp has also been reported to cause clinically significant DDIs via P-gp inhibition or induction, i.e., digoxin-verapamil and digoxin-rifampicin (Marchetti et al., 2007). A number of anticancer chemotherapeutic agents such as paclitaxel, doxorubicin, and topotecan are known P-gp substrates and are being coadministered with veliparib. To further characterize the potential DDIs of veliparib with these P-gp substrates, we evaluated whether veliparib inhibits P-gp activity using digoxin as a probe substrate in Caco-2 cells. Our study demonstrated that veliparib did not inhibit P-gp-mediated digoxin transport up to 1000 μM. The projected clinically efficacious dose of veliparib in combination with TMZ is 40 mg twice a day. The intestinal concentration of veliparib is estimated to be approximately 650 μM, at which veliparib is not expected to inhibit P-gp activity in the intestine. A good in vitro-in vivo correlation was established for varenciline. Varenciline did not have a clinically relevant effect on digoxin exposure in vivo, supported by in vitro studies that varenicline was neither a P-gp substrate nor an inhibitor of P-gp-mediated efflux of digoxin in Caco-2 cells (Faessel et al., 2008). Overall, veliparib would not be expected to have clinically significant P-gp-mediated DDIs. In addition, veliparib is not likely to cause clinically significant DDIs mediated by P450s. Veliparib was metabolized in vitro by multiple recombinant human P450s including CYP1A2, 2D6*1, 2C19, and 3A4. The highest turnover was observed with CYP2D6*1, consistent with a previous study, in which CYP2D6 was shown to be the predominant enzyme for veliparib metabolism (Li et al., 2009). Common allelic variants CYP2D*10 and *4 showed reduced catalytic activities, compared with wild-type CYP2D6, indicating that CYP2D6 pharmacogenetics may affect veliparib pharmacokinetics and efficacy in clinical studies (Li et al., 2009). CYP2D6 polymorphism has been associated with clinically relevant DDIs when drugs significantly rely on the enzyme either for clearance or metabolism to an active metabolite (de Groot et al., 2009). However, in humans, 70% of the veliparib dose, on average, was excreted in urine as parent; thus, metabolism contributed to at most 30% of total clearance. In addition, veliparib was metabolized by multiple pathways including oxidation catalyzed by other P450s and UGT-mediated N-carbamoyl glucuronidation. The contribution of CYP2D6 to total veliparib clearance may not be significant in humans. Therefore, CYP2D6 polymorphism or coadministration of veliparib with CYP2D6 inhibitors would not cause clinically significant DDIs. In addition, veliparib did not inhibit activities of CYP1A2, 2A6, 2C9, 2C19, 2D6, 2E1, 2B6, 2C8, and 3A4 in human liver microsomes (IC50 > 30 μM) or induce the activities of CYP1A2, 2B6, 2C9, and 3A4 in human hepatocytes up to 10 μM (data not shown). Those concentrations obtained in in vitro evaluations are much greater than the projected efficacious plasma concentration of 0.78 μM in clinics. In summary, veliparib disposition was characterized by high absorption, wide tissue distribution, and primary renal clearance followed by metabolic clearance. In urine and plasma, the major drug-related component was unchanged veliparib. Veliparib is not likely to cause clinically relevant DDIs mediated by P-gp and P450s. Taken together, these attributes point to favorable dispositional and DDI profiles, the desirable characteristics for a safe and effective therapeutic agent. Participated in research design: Delzer and Lao. Conducted experiments: Li, Delzer, and Lao. Performed data analysis: Li, Delzer, and Lao. Wrote or contributed to the writing of the manuscript: Delzer, Voorman, de Morais, and Lao. We thank Dr. Bruce Surber for synthesis of [3H]veliparib and David Whittern for conducting NMR experiments. We acknowledge Mark Mason, Robin Shapiro, and Tanita Mason-Bright for conducting animal studies. We also thank Drs. Daniel Bow, Alexander Shoemaker, and Vincent Giranda for their support and critical review of the manuscript. American Cancer Society (2010) Cancer Facts and Figures 2010, American Cancer Society, Atlanta, GA.
(2009) Understanding CYP2D6 interactions. Drug Discov Today 14:964–972.
. (2007) ABT-888, an orally active poly(ADP-ribose) polymerase inhibitor that potentiates DNA-damaging agents in preclinical tumor models. Clin Cancer Res 13:2728–2737. (2008) Lack of a pharmacokinetic interaction between a new smoking cessation therapy, varenicline, and digoxin in adult smokers. Eur J Clin Pharmacol 64:1101–1109. (2010) ABC transporters in the blood-brain barrier limit the brain penetration of the PARP inhibitor ABT-888. Proceedings of the AACR 101st Annual Meeting 2010; 2010 April 17–21; Washington, DC. Abstract LB-49. American Association for Cancer Research, Philadelphia, PA.
(2008) Effect of human renal cationic transporter inhibition on the pharmacokinetics of varenicline, a new therapy for smoking cessation: an in vitro-in vivo study. Clin Pharmacol Ther 83:567–576.
. (2009) Phase 0 clinical trial of the poly(ADP-ribose) polymerase inhibitor ABT-888 in patients with advanced malignancies. J Clin Oncol 27:2705–2711. (2009) Pharmacogenetics of a PARP inhibitor ABT-888 metabolic pathway. J Clin Oncol 27 (Suppl):Abstract e14556. (2007) Concise review: clinical relevance of drug-drug and herb-drug interactions mediated by the ABC transporter ABCB1 (MDR1, P-glycoprotein). Oncologist 12:927–941. (2009) Ongoing phase 1 studies of a novel PARP inhibitor, ABT-888: pharmacokinetics, safety and anti-tumor activity. Proceedings of the AACR 100th Annual Meeting 2010; 2009 April 18–22; Denver, CO. Abstract 3602. American Association for Cancer Research, Philadelphia, PA.
. (2010) Plasma and cerebrospinal fluid pharmacokinetics of ABT-888 after oral administration in non-human primates. Cancer Chemother Pharmacol 65:419–425. (2006) Metabolism and disposition of varenicline, a selective α4β2 acetylcholine receptor partial agonist, in vivo and in vitro. Drug Metab Dispos 34:121–130.
. (2009) ABT-888 confers broad in vivo activity in combination with temozolomide in diverse tumors. Clin Cancer Res 15:7277–7290. (2009) Poly(ADP-ribose) polymerase inhibition in cancer therapy: are we close to maturity? Expert Opin Ther Pat 19:1377–1400. (2010) Small-molecule PARP modulators—current status and future therapeutic potential. Curr Opin Drug Discov Devel 13:577–586.
. (2009) Discovery of the poly(ADP-ribose) polymerase (PARP) inhibitor 2-[(R)-2-methylpyrrolidin-2-yl]-1H-benzimidazole-4-carboxamide (ABT-888) for the treatment of cancer. J Med Chem 52:514–523. (2010) PARP inhibition: PARP1 and beyond. Nat Rev Cancer 10:293–301. U.S. Food and Drug Administration (2006) Guidance for industry: drug interaction studies-study design, data analysis, and implications for dosing and labeling. U.S. Food and Drug Administration, Rockville, MD. (2000) The biotransformation of nitrogen containing xenobiotics to lactams. Curr Drug Metab 1:357–389. (2010) Simultaneous determination of ABT-888, a poly (ADP-ribose) polymerase inhibitor, and its metabolite in human plasma by liquid chromatography/tandem mass spectrometry. J Chromatogr B Analyt Technol Biomed Life Sci 878:333–339. (2010) Deaths: final data for 2007. Natl Vital Stat Rep 58:1–136.